Visit the exhibition of shortlisted designs for the National Holocaust Memorial at Parliament's Westminster Hall from 26 February to 11 March. An exhibition of the shortlisted teams’ designs for the National Holocaust Memorial and education centre is on display and open to the public in Westminster Hall in Parliament from Monday 26 February. The international design competition sought to harness the very best architectural talent to create an emotionally powerful and sensitively designed memorial. Ninety-two teams expressed an interest in the project, with a shortlist of 10 invited to submit the concept designs on display as part of this exhibition. Consultation with the public, survivors, those working in the field of Holocaust remembrance and education, and technical experts will play a crucial role in informing the final decision of the jury. Visitors are invited to give their views as part of the exhibition. View the 10 shortlisted designs and submit your feedback. The exhibition is open from Monday 26 February until Saturday 11 March, from 9am each morning. Entrance is via Parliament’s Cromwell Green entrance. Read more about finding the Houses of Parliament. Closing times will vary depending on parliamentary business each day and will close at 5:30pm on non-sitting days (Friday 3 and Saturday 4 March). 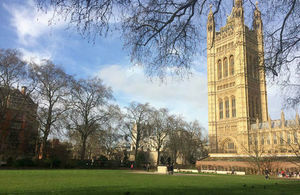 Parliament has advised visitors to avoid busy periods, notably between 3pm and 7pm on Tuesday and Wednesday afternoons. Visitors will go through an airport-style search. For further information on entry arrangements, call Parliament’s Visitor Services on 020 7219 0516. 6 March 2017 Exhibition has been extended until 11 March. 27 February 2017 First published.